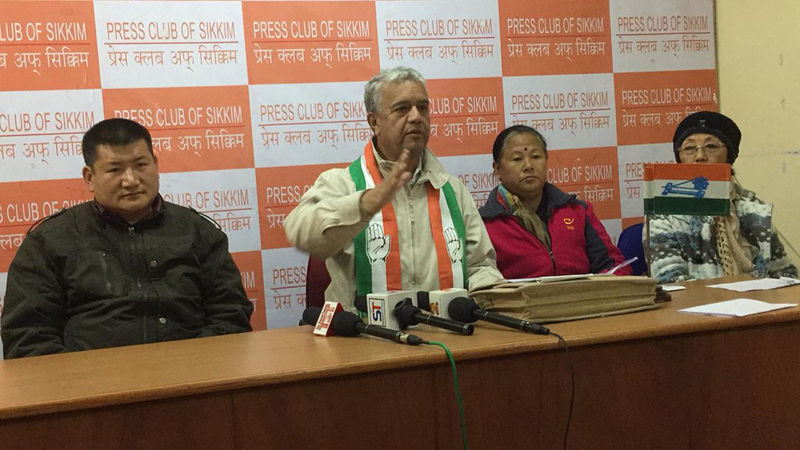 The Sikkim Pradesh Congress Committee (SPCC) has prepared its first list of 16 candidates for the upcoming Assembly elections in the State and the same has been sent to the All India Congress Committee (AICC) for approval. Addressing a press conference here on Sunday evening, SPCC working president Dipendra Gurung announced the names of 16 candidates of the party figured in the first list prepared by the State Congress. According to the State Congress’ list, Pema Rinzing Bhutia will contest from Yuksom-Tashiding constituency and Mangal Subba from Yangthang, Dipendra Gurung from Maneybong-Dentam, Dal Bahadur Karki from Gyalshing-Bermiok, Tej Bahadur Rawat from Soreng-Chakung, Ganga Maya Cintury from Salghari-Zoom, Ishwar Prasad Rai from Poklok-Kamrang, Sanchaman Chettri from Namthang-Rateypani, Deepak Kumar Bhandari from Temi-Namphing, Tula Ram Guragai from Khamdong-Singtam, Deo Kumar Pradhan from Rhenock, Gopal Chettri from Chujachen, Dorjee Wangdi Bhutia from Gnathang-Machong, Sunumit Targain from Gangtok, Penzong Lepcha from Dzongu and Acharya Karma Tashi from Sangha. He also informed that the AICC has already approved SPCC president Bharat Basnet as the Lok Sabha candidate in Sikkim. Gurung mentioned that the party was open for possible alliance in the State but it did not happen. So, the Congress decided to go alone to contest all the 32 Assembly seats and lone Lok Sabha seat in the State. He mentioned that protection and strengthening of Article 371F, restoration of Nepali seats in the State Assembly and tribal status to left out communities of Sikkim on the basis of the Sikkim Subject and not caste are the main issues for the Congress. SPCC president Bharat Basnet informed that the AICC will also include two issues of Sikkim in the national election manifesto. He said the issues of restoration of Nepali seats in the State Assembly and tribal status of the left out communities on the basis of Sikkim subject will be included in the national election manifesto. Basnet said he will visit all villages of Sikkim as a part of the election campaigning in the State. He informed that the election manifesto has already been drafted and presently in the printing phase and will be released soon. Speaking on political issues, Basnet mentioned that regional parties have now been compelled to connect with the national party to effectively pursue issues of the State at the Centre. He added that the Congress has given the special status to Sikkim and the party can only work in the interests of Sikkim and its people.